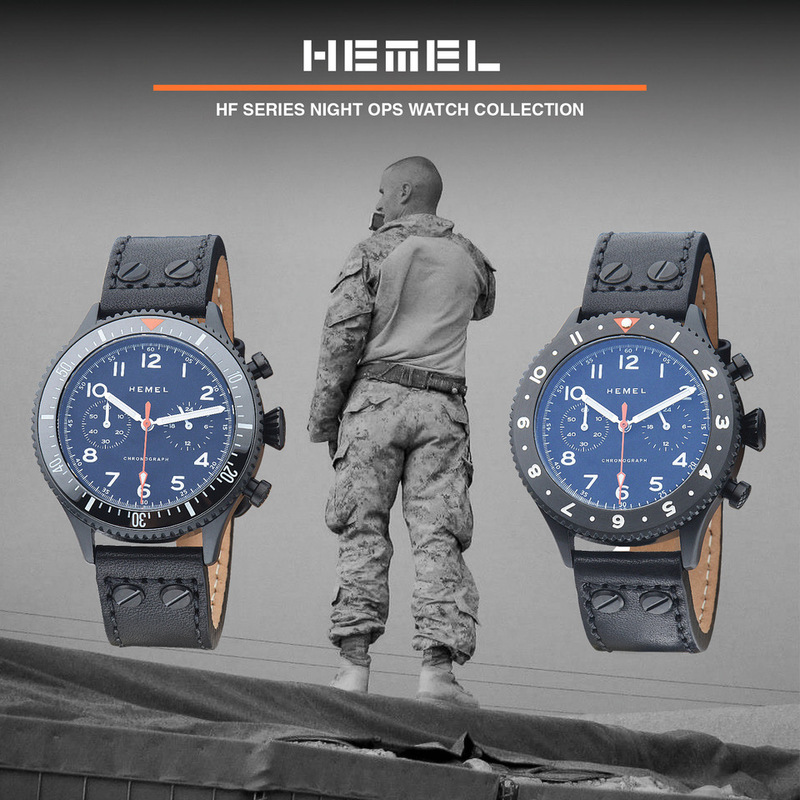 So just to be clear from the get-go, the NTH Subs Series are among my favorite watches. Ever since I first reviewed them in July 2016, I've loved the line's classic proportions, neo-vintage designs, and reasonable price. Apparently, I was not alone because Chris Vail of the Janis Trading Company has since turned out dozens of variants, all sharing the same case while exploring different colorways, handsets, and layouts. Chris let me sample two of the newest, and arguably most radical, releases: the unisex Dolphin Magenta, and the Watch Gauge exclusive Nazario Sauro, both of which sell for $650 USD. Proportion is the key ingredient in the Subs recipe. I can think of few others that have gotten it so right. Like the famed Rolex Submariner that inspired them, Subs are 40mm wide. 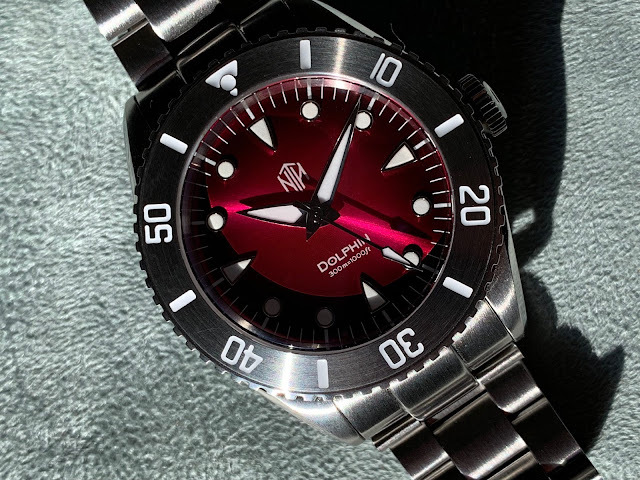 At 48mm lug-to-lug the NTH is 1mm longer than a 5513 Submariner, but it beats the Rolex by about 2mm in thickness, measuring a scant 11.5mm, which is outstanding for a 300m diver packing an automatic movement. It would have been easy to bulk up the watch with a fat crown and a pair of guards, but Chris chose a different route, fitting one with a broad, flat head that tucks in close, more like a 1950's vintage 6538, small crown, no-guard Rolex. The case has a brushed finish accented by a polished bevel running its length. The result is trim, tidy, and a perfect fit on the Bum's 6.5" wrist. 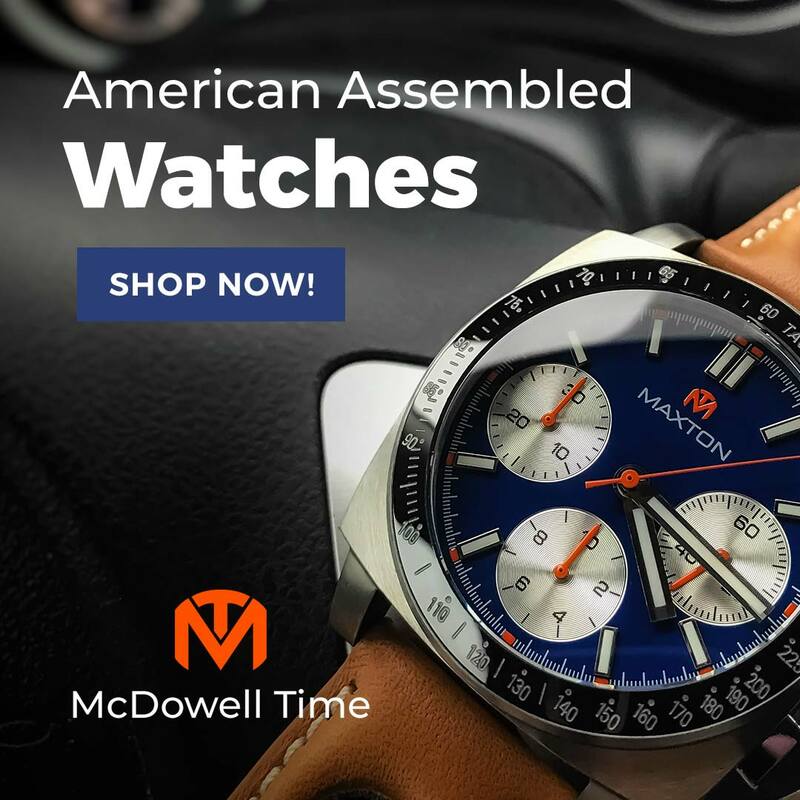 Like previous Subs, the new models have a double-domed, anti-reflective sapphire crystal and a 120-click, unidirectional bezel with an engraved steel insert. Inside is the ever-popular 24-jewel, 28.8k Miyota 9015 automatic. Bracelets have been upgraded since the last incarnation. Still 20mm wide, the links are smaller for better articulation. As before, drilled lugs facilitate removal and the links secure with single-ended screws. Be sure to have a 1 to 1.2mm screwdriver handy. The signed clasp has also been redesigned. The new one (left) is significantly longer than the old one (right) and has beveled edges where the older one was round. This new arrangement suits me fine, but there is one glitch. NTH ships the watches with two half-links at the clasp, which is great for getting the perfect fit; however, the clasp ends will now only accept a half link, not a full size. This is a pretty significant mistake on the part of the factory as it nullifies the advantage of having the half links in the first place. It is a known problem, and Vail is already on the case. New links are being made now and will be included with new sales and provided free of charge to those who have already purchased. Getting a part that doesn't work as you expected is a pain, but I like the way NTH is handling this. Manufacturing errors happen from time to time. The way a brand handles the correction speaks volumes about who they are, and whether I would buy from them again. This is exactly the sort of quick and efficient response that instills confidence. Now we can get to really fun stuff. Both of these Subs are striking in entirely different ways. Following the previous Subs' convention, the Nazario Sauro takes its name from an Italian Navy submarine, itself christened after a World War One hero. 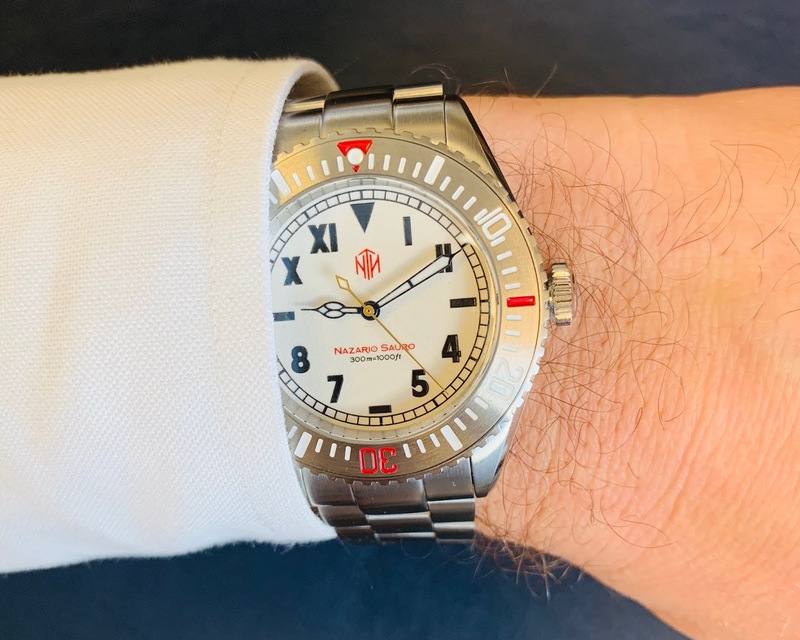 The layout features a railroad track index, poire squelette hands, and a half Roman, half Arabic "California dial" surrounded by an engraved steel bezel with red quadrant markers. It was adapted from the rare (12 made!) Rolex Zerograph Ref. 3346. The Suaro is the second incarnation of this design. NTH's first incarnation of this design was the now sold-out Nazario (no second name). In Old Radium lume on black, it was a good looking watch and truer to the original. Still, I prefer the new model. That black-on-white, full-lume, textured dial is stunning in daylight and glows like mad at night. I also find the white clicks with the steel and red in a way that is more pleasing to my eye. A gold second hand adds a dash of unexpected flavor that heightens the face as a whole, like a sprinkle of salt on your caramel. It's like something you might wear on an arctic expedition. The Dolphin is another story. While the Nazario Sauro channels a vintage military vibe, the Dolphin aims for fashionable refinement. 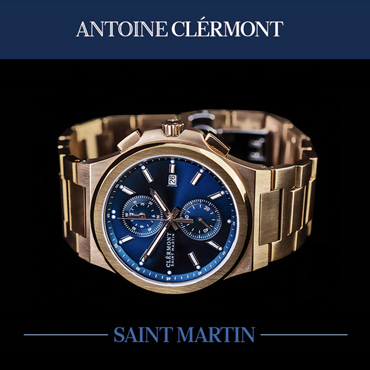 As mentioned above, the case is the same 40mm unit as all the others, and the dial retains a traditional diver's layout. I think of unisex models as being small to mid-sized, somewhere from 34-38mm, so when I first saw photos of the watch, had to ask Vail what exactly made it "unisex?" I got an earful. Keeping the standard Subs case meant that a host of tricks was required to dress it up and dial down some of its tool watch qualities. The polished dot markers are smaller than they are on the rest of the line and subtly curved sides on the dart markers and matching leaf hands soften the layout. The brushed and sparsely marked bezel is more neutral than a colored insert, lending more weight to the eye-popping color on the dial (a low-key sunray silver dial is the other option). A 6 o'clock date window is optional. So, does it work? Yes and no. To my eye, the watch looks great. That dazzling magenta dial is unlike anything in my collection or any of my watch friends' collections for that matter. It would be a real stand-out and fun to pair with different straps. But does it look smaller? I'm not convinced. I lay the blame on the bezel. I realize that it makes good fiscal sense to keep as many common parts as possible, but a broad, gear-toothed bezel is going to draw your eye to the edges of the case. I've found that rounded, mirror polished surfaces tend to look smaller as they blur the distinctions and place more emphasis on the dial. Of course, a redesigned bezel would add to the cost, but short of that, I'm not sure there is much else to minimize this dive-style case. Since this is a unisex watch, I solicited Mrs. Time Bum's opinion. She had two key observations. First, it is a dive watch, and she hates dive watches. There is no getting around that one. You either like the style, or you don't. 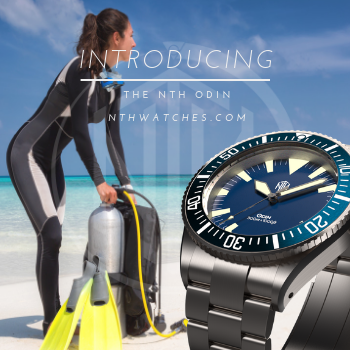 I know a number of other women who dig dive watches, some of whom already own other Subs. They will likely enjoy the Dolphin as well. Second, Mrs. Time Bum thought it was too big, and in her case, she has a point. Her wrist is small, just about 6" around, so the Dolphin's case filled it to the edges. As such, you couldn't see the bracelet when viewed head-on. It hadn't occurred to me, but to her, it was proof that the proportions were wildly off. Does this mean the watch is unsuitable for all women? Absolutely not. I have always felt that a woman can carry off an oversized watch much better than a man, it's just a matter of personal style. Moreover, the Dolphin is hardly what one would call huge. Finally, while women tend to have smaller wrists than men, there is a range. Recent Guest Bum Meredith Clark has a 7.5" wrist and had no problem wearing a 44mm cushion case watch. She would certainly have no issues wearing this one.